As I said before, this bike isn't made for high speeds, it is very comfortable at around 30-50mph which is great for zipping to the store or around a campsite. One more quick little point, this moto gets phenomenal gas mileage! Most people report getting around 70-80mpg easy, and with the price $3,949.00 MRSP this is a great entry level motorcycle for the street or for the dirt. I definitely wouldn't mind having this bike in my stable. Lightweight at only 249lbs, Geared low for climbing hills and low speed turns, Fantastic gas mileage, Electric start makes it easy to just press a button and go! 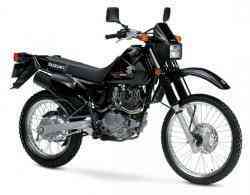 The Suzuki DR200SE is a smaller displacement dual-sport that would make a great beginner motorcycle. It feels at home on the surface streets, or in the dirt with a robust engine with enough torque to get you over the hills or out of dangerous traffic! 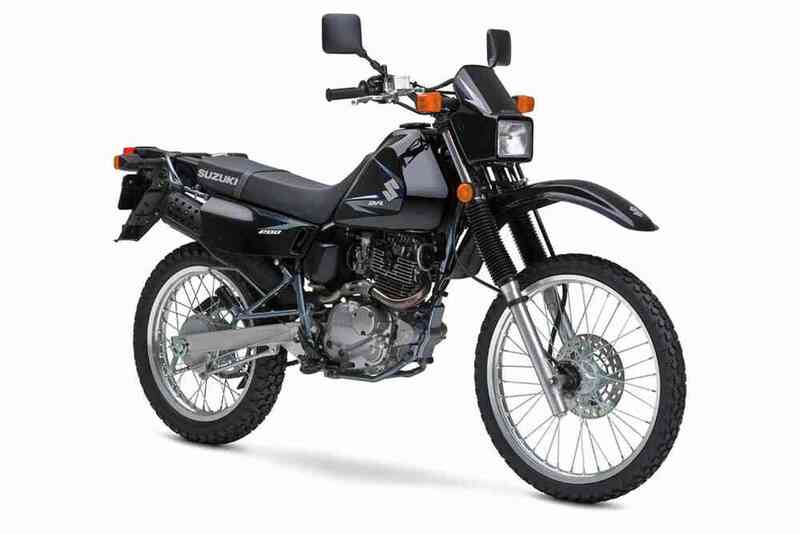 The DR200SE is packing a 200cc, single-cylinder, 4-stroke engine that is ideal for tearing around surface streets or forest trails. The transmission is geared pretty low which is great for learning, you won’t be traveling 20-30mph in first gear like you would with some other sport bikes! 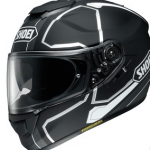 The lower gear sets will also give you lots of time to practice shifting, although you will have to do it by the sound of the engine as this bike doesn’t include a tachometer with the instrument cluster. This bike is definitely not a touring freeway motorcycle either. Most people say that the bike will do 55-65 mph for a while, but any higher than that and it’s just not comfortable. It tops out at around 90mph, but you would need balls of steel to wring it out that much! That being said, on fire roads, dirt roads, and camping trails this bike is perfect. 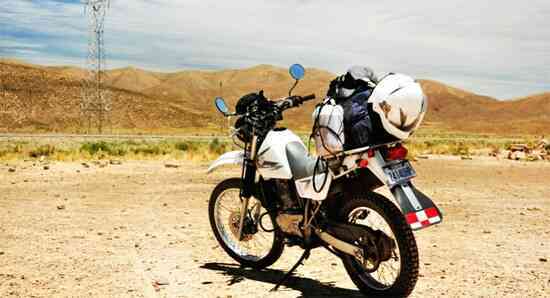 You can even through a bit of gear on the back for some motorcycle camping. The tires on this motorcycle are decent for stock, but they will limit you if you plan on riding a lot in the mud and sand. They just don’t give the type of traction you will need. On dirt trails it is a different story as this bike really grips and becomes a lot of fun. If this is your first motorcycle and you are buying it to learn on the street then you won’t be disappointed in the least, this bike was made for tooling around town. I’ve also seen a few conversions of this bike into a supermoto by adjusting the suspenpension and slapping on some street tires. If you do this then it really doesn’t do well on the dirt, but it can make some of the twistier roads a bit more fun. It is 100% street legal with a license plate holder, turn signals and mirrors. Dual sports are generally pretty tough and this little bike is no exception, dropping it at low speeds which is a common beginner mistake won’t cause any major damage to the bike. The DR200SE comes in at a slim 249 pounds dry, which make low speed maneuvers with really easy compared to a larger sportbike. The light weight can be a double edged sword when traveling at higher speeds as you tend to get blown around more by the wind. As I said before, this bike isn’t made for high speeds, it is very comfortable at around 30-50mph which is great for zipping to the store or around a campsite. One more quick little point, this moto gets phenomenal gas mileage! Most people report getting around 70-80mpg easy, and with the price $3,949.00 MRSP this is a great entry level motorcycle for the street or for the dirt. I definitely wouldn’t mind having this bike in my stable. Electric start makes it easy to just press a button and go!